This episode was ridiculously frustrating to watch and they all boiled down the same reason. Bumbling cops. You’re out of the time, you idiots. You don’t have the hours or minutes to sit, sleep, worry or cry. Get out there and plan something, anything! It’s when the writing fails like this for the sake of stretching the plot a few episodes further that I get really, really irritated. Truthfully, we truly only have enough material for 12 episodes in this show, and honestly, if they’d kept it that way (a la Liar Game though I yearn for more on that end) this could have been a stellar show, instead we’re treating to montages of our favourite duo of bumbling cops who are great as people but incredibly frustrating as cops, and Chorim and Moogak having arguments and brushing hair gently off the other’s forehead. Lovely, adorable, you two. 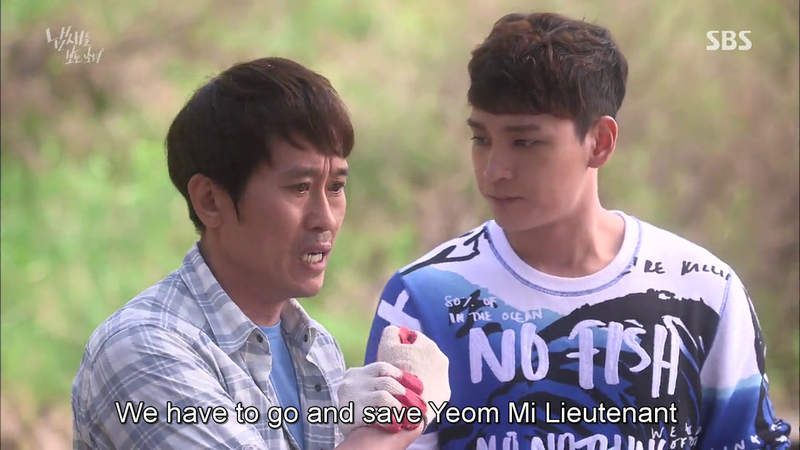 Now can we get a handle and save Lieutenant Yeom? Yes? The perfume bit that I thought was going to be Yeom Mi’s ticket out was wasted in this episode as it only served to confirm that Jaehee has Lieutenant Yeom stashed somewhere in his place. Which we already knew judging by the duration between Yeom Mi’s disappearance and the drive to Jaehee’s house. There’s no way he could have stashed her elsewhere and run over to his house in time for Moogak to barge in (again). Instead, they wait three days to concoct a plan. I can understand Jaehee accepting the offer late, but not the cops and Chorim waiting this long to make the offer. Now shall we move onto how much is wrong with that plan? First off, this is Jaehee, whom we’ve seen to be diabolical and devilish and fond of used double-decoys. So do you honestly think he’s not going to have a few people on watch at those locations he’s having Chorim run to? And if he forgot to do so, why have Chorim run about to begin with? He was clearly in his car at the park all along. How on earth could he check if she was being followed? And even if we ignore that, there’s the fact that Moogak was very, very obviously in sight of Chorim’s position at the park. I’m surprised Jaehee didn’t look left and right before going to her. And Chorim could have simply pretended to inhale the anesthetic and thereby saved precious time instead of riding on that ambulance. On the other hand, having the I’ve-a-robber-in-my-trunk cop (who played Hwang Dal Joong in IHYV) act as a jogger was quite clever, even if he sucked at it. I’m surprised Jaehee fell for that. He can read a person’s tone of voice even if not their emotions. Dumping that liquid on Jaehee’s pedal was also quite the good idea. And yet, this show seems to take one step forward and two steps back when it comes to executing its ideas because that bit with the rain and that child’s drawing was totally, utterly unnecessary. I honestly groaned when the typhoon of doom began. I mean seriously? Did they just give up like that? I’d tear the place upside down in the rain until I found something. It’s not a large lot, why on earth would you give up like that. And I truly don’t understand how throwing wood shavings or hay or whatever it was about, helped Chorim see the scent again. That’s not how rain works, I’m afraid. It really does wash scents away. Soil shifts and the water pooled in the soil does flow, or join groundwater. Isn’t that why it’s difficult for police dogs to sniff anything out after a rain? The chances of the scent remaining in the exact same place are really slim. I like this show, I really do. I can even suspend belief for some of the crazier antics this team of cops has pulled off, but honestly I’ve reached my limit. I swear, they find the entrance to Jaehee’s lair and just stand there busy marveling at the fact that they found it, and hi-fiving and I was just about ready to tear out my hair. But let’s get on with what was glorious about this episode. Namely Yeom Mi and Jaehee. Gosh these two are amazeballs together. Yeom Mi is clearly frightened but keeps an incredible hold overself, preventing Jaehee from seeing even the slightest bit of her fear. She banters with him, profiles him and even gains some form of his grudging respect with the way she gave away the remaining hours of her life, and figured his out so accurately. She didn’t break until the end. The end of her incarceration that is, I refuse to believe that she may die, Moogak and the others were only a little bit late. (See, this is why you should have laid off the hi-fivng). Interestingly enough I believe that this may be the first time Jaehee has spent time with a victim. Face to face, that is. 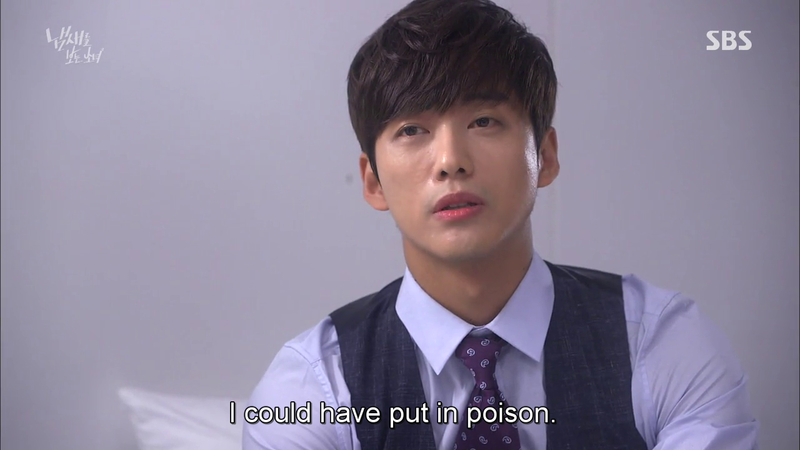 I don’t believe he ever once sat and talked with Dr. Chun/Joo Mari (why did he kill her if they were dating?) 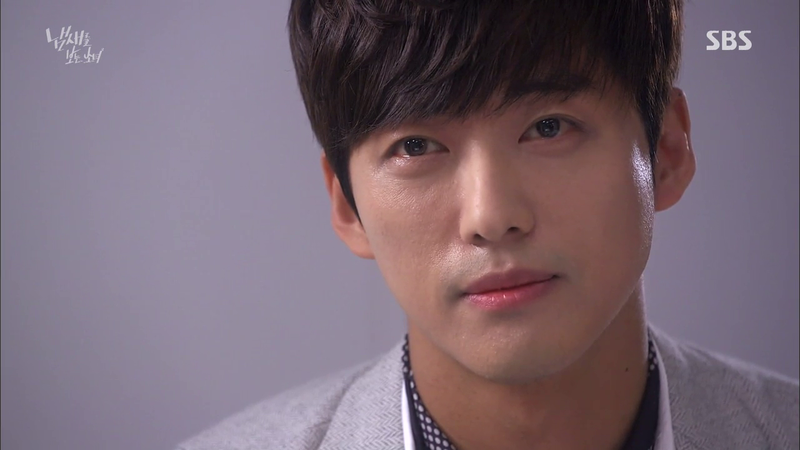 as he did with Yeom Mi. 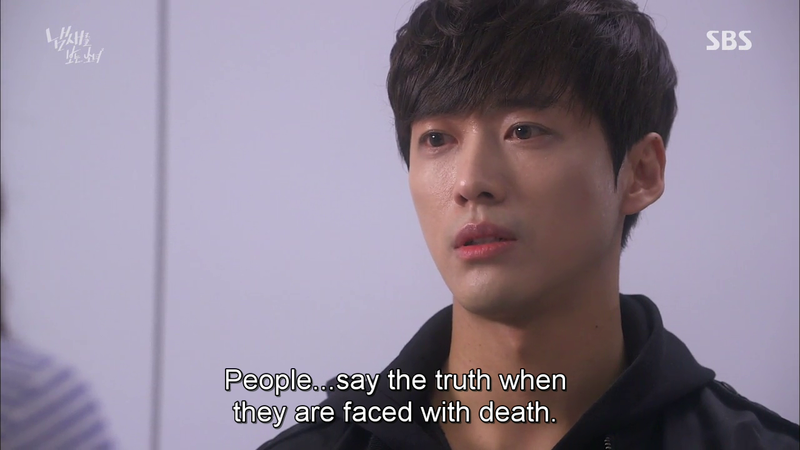 For those who weren’t killed in his White Room of Death and Diary-writing, he probably just lurked in a corner of the room dressed like Healer, as we saw him do previously with Eunseol/Chorim’s mom. It’s a fascinating sort of relationship the two have. They really get each other in this strange twisted way (on Jaehee’s side of course). It doesn’t mean that they like each other or want each other to live, but that they know exactly what the other person is like. Jaehee for example knows that Yeom Mi isn’t lying when she says that everything she wrote was a lie and it could be the same with others. And Yeom Mi profiles Jaehee instantly. She probably figured it all out back when they met at the restaurant. Getting the layers peeled back on Jaehee’s abuse was pretty satisfying. I only wished they’d delved deeper into his past. 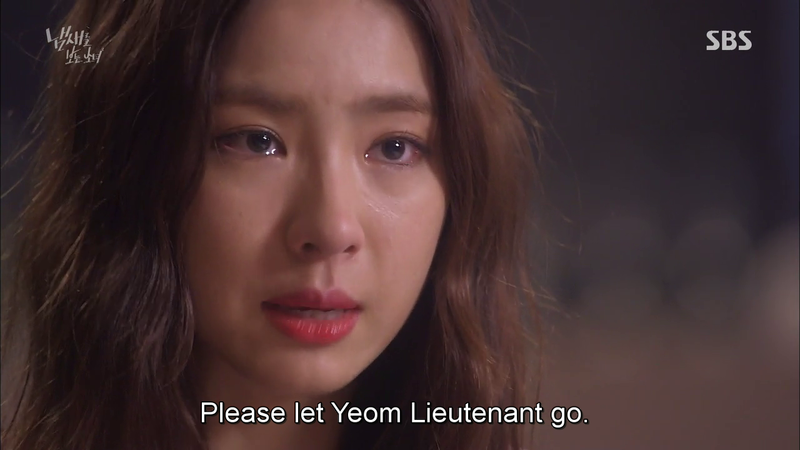 The same goes for Yeom Mi, I thought her father would have been brought up for sure but neither of them spoke of it. Odd. I really want to know more of her (I love Chorim and Moogak but I’ve honestly have enough of them. I can’t believe I’m tired of seeing our OTP but there you go.) This girl has such courage, I’m honestly loving her. 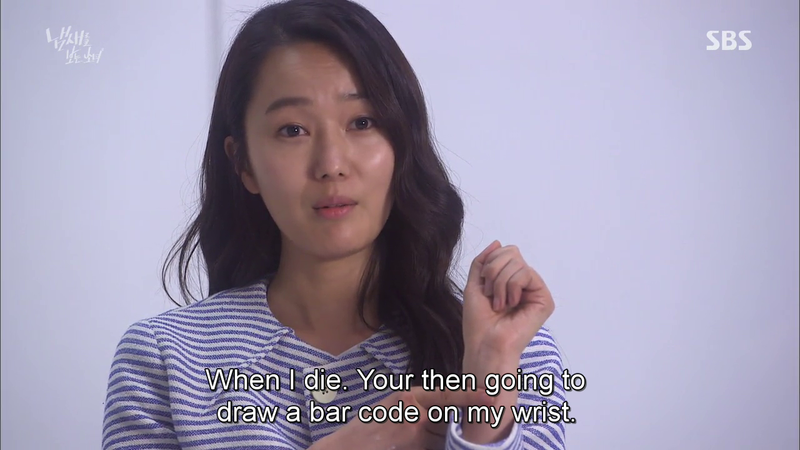 The way she resolutely faces death is just…I swear my heart was doing overtime for a few minutes there. 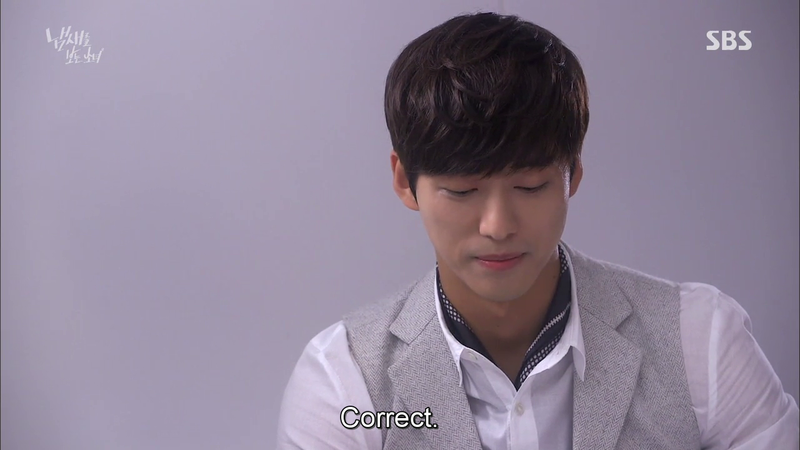 And can we all have a round of applause for Nam Goongmin here? What is with these crazy young looking almost ahjusshis? 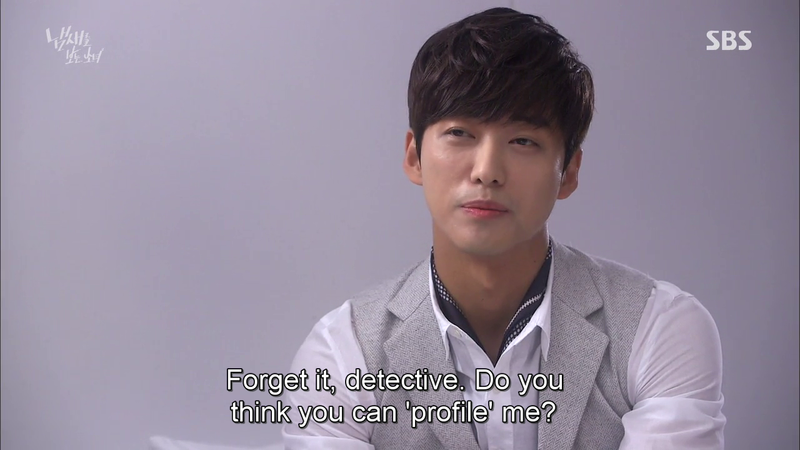 From Ji Sung to Nam Goongmin, I cannot believe these men are over 35, especially the latter. The man is fit as hell and I swear he looks like he’s no older than 25. I honestly want him to land more leading roles in the future. His acting has been incredibly solid until this point. I mean look at this change of expression. He really is good at this. This isn’t an I’m-a-stonefaced-killer-hear-me-roar sort of face. He’s actually partially moved, and partially pissed out of his mind. You can feel that coldness and intensity. You can practically hear him saying, “why didn’t anyone do this for me?” There’s a vulnerability to Jaehee. 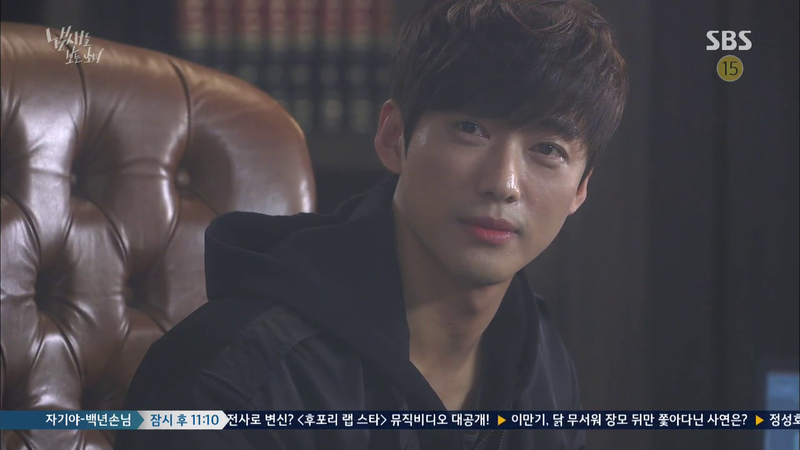 We see a flashes of it in scenes like this, but it really manifested in his conversation with Yeom Mi. It’s when the two of then speak that I think of what this drama could have been, regardless of how much I’m enjoying it now. My nitpicking isn’t because I dislike the drama but rather because I keep seeing these nuggets of greatness in it. That greatness though, is entirely my opinion, so I’m sure some people are going to adore this drama and others are going to hate it and that’s all good as well. As we head into finale week (so soon?) here’s my version of what I would have loved for this show. A romantic suspenseful thriller starring Choi Moogak, the brooding officer grieving for the unjust death of his sister and out for revenge, Oh Chorim, the smell seeing amnesiac newbie who joins the force to use her talent to help people, Kwon Jaehee, the handsome but eerie chef with prosopagnosia as a result of severe childhood abuse, and last but not least Lieutenant Yeom Mi, the intelligent head of the case who lost her father to the killer and is determined to find his murderer, regardless of what methods she has to go to. Over the course of several cases, Chorim proves herself to be a great detective, Moogak learns of her smell-seeing ability and the two grow to care deeeeeeeeeeply for each other. Meanwhile Jaehee’s on the loose, so the entire team goes after him. In a rational, well-thought out manner, that is. They catch him and jail him, Moogak and Chorim live happily ever after, the I’m-15-year-older cop gets with Elena Vashilivanova, and Yeom Mi visits both couples occasionally with the other bumbling cops and often pops by the jail to irritate Jaehee. The end. Now I want to see this show. I was also frustrated with ep 14. It was crazy frustrating. Cho Rim couldn’t see the scents so let’s give up? What? Try SOMETHING! 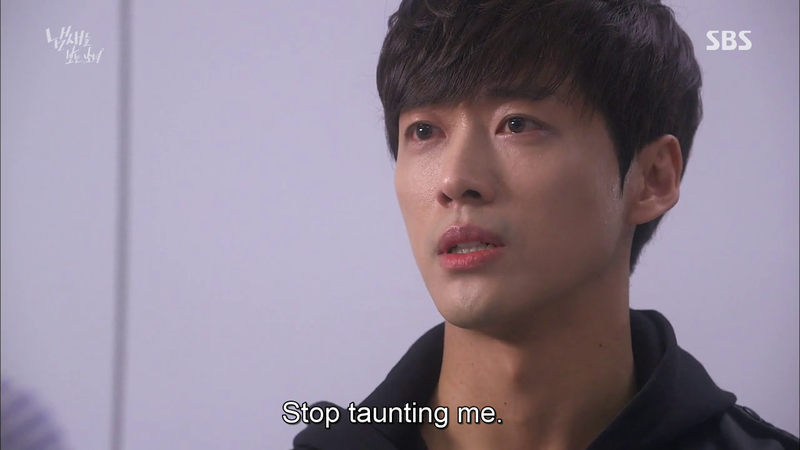 The incompetency was real and ep 14 ended the same with Moo Gak pointing gun at Jae Hee. The show had its redeeming points but that part in ep 14 where their just standing around and dragging the search, I was like, this has got to be to fill up screen time. And I realize that we really don’t know that much about Chef Kwon nor Yeom Mi. Its strange. 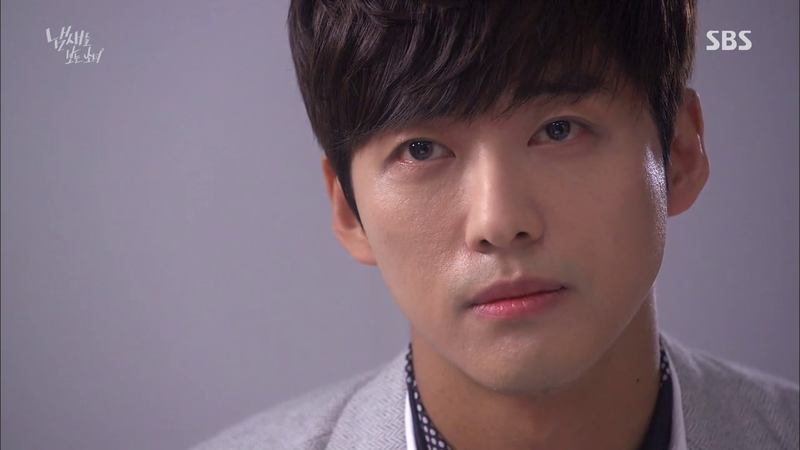 I was really hoping that they would develop Jae Hee but it looks like we’ll just be told through exposition. Not fun. Anyway, I haven’t seen ep 16 yet but stopped by to hear your thoughts. Thanks! I’ll be back later!